Colbart’s Bicycle Shop, a family run business located in Edon, Ohio, owned by John and Valda Colbart, recently donated an adult bicycle to be raffled off in the Tour de Book bicycle raffle. The Tour de Book is a county wide 75 mile bicycle marathon that visits every library in Williams County, and is sponsored by Williams County Public Library, the Montpelier Public Library, and the United Way of Williams County. The marathon will take place on September 27th at the Bryan Main Library. The bicycle raffle includes a child’s bike and the donated adult bike. Tickets for the raffle are $1.00 each or 6 tickets for $5.00, sold at all branches of WCPL and the Montpelier Public Library through September 27th. The raffle winner will be chosen on September 29th. The proceeds will benefit all “friends” of Williams County. The Williams County Public Library, Montpelier Library and the United Way of Williams County would like to thank Colbart’s Bicycle Shop for their generous donation. © 2014 – 2018, The Village Reporter and/or The Associated Press. All rights reserved. 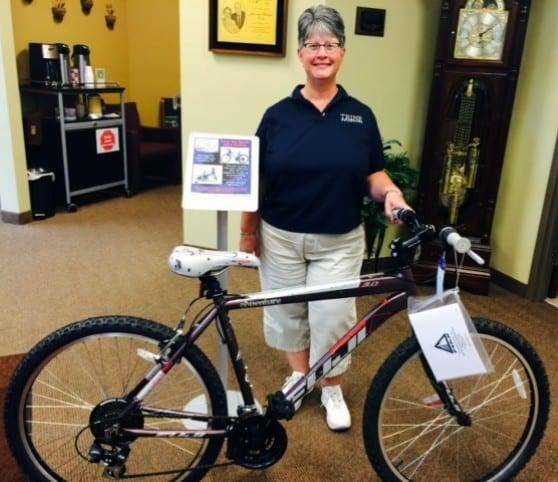 Be the first to comment on "Edon Bike Shop Colbart’s Donates Bicycle For Tour De Book Raffle"